Free radicals steal oxygen from the body, causing decay, such as cellulite, gum disease, low energy, heart disease, breakdown of arteries, easy bruising, lowered immune system and more. 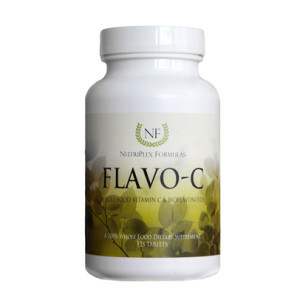 Flavo-C is full of bioflavonoids — powerful antioxidants that restore oxygen to the body – and Vitamin C, making it a powerful formula. Vitamin C, flavonoids, and other whole food ingredients are needed for repairing and preventing cellular damage, as well as for slowing down the aging process. Excellent for energy, and support of blood vessels, eyes, organs, skin, connective tissue, the immune system, and more! Acerola Cherry,* Bilberry Fruit,* Echinacea Purpurea Root,* Wildcrafted Wild Pansy Flour, and Wildcrafted Horse Chestnut Leaf. Inactive Ingredients: Cellulose, Acacia and Potato Starch. In addition to the unique properties, synergists and cofactors of this food, each serving provides the following nutrients contained within the above food-nutrient blend (not as isolates): Vitamin C (not as the isolate/synthetic ascorbic acid), but rather the entire whole food complex, including Antioxidants, Bioflavonoids (especially Rutin), Trace Mineral Activators, Enzymes, Synergistic Minerals, and more. 4 tablets daily, or as directed by a healthcare practitioner. Not intended for pregnant or lactating women without consent of a physician. Vitamin C-ascorbic acid pills are not enough! An insufficient dietary intake of vitamin C complex and related bioflavonoid complexes and synergistic nutrients found in whole, raw foods may lead to problems with capillary fragility that impairs healing, eyesight (macular degeneration, glaucoma) and leads to bruising; fails to nourish the adrenals and other glands; manifests in “spider veins” and varicose veins; and suppression of the immune system, manifesting in susceptibility to colds, flu and infection. Vitamin C complex is most notably associated with its healing benefits to protect against destruction and disintegration of epithelial and endothelial cells, as in scurvy, gum disease, cellulite and arterial damage. Further, antihistamine qualities of Vitamin C foods are helpful in skin eruptions and allergic reactions.